Durand-Ruel Galleries, New York (acquired from the above, 7 January 1899). Joseph F. Flanagan, Boston (acquired from the above, 29 March 1912); sale, The American Art Association, New York, 14 January 1920, lot 54. Scott & Fowles, New York. M. Knoedler & Co., Inc., New York. Colonel Henry D. Hughes, New York. Acquired from the above by the late owner, 8 May 1929. F. Daulte, Auguste Renoir: Catalogue raisonné de l'oeuvre peint: Figures, 1860-1890, Lausanne, 1971, vol. I, no. 89 (illustrated). B.E. White, Renoir: His Life, Art, and Letters, New York, 1984, pp. 47-48 (illustrated, p. 47; titled Woman with Umbrella (Camille Monet)). B.E. White, Impressionists Side by Side: Their Friendships, Rivalries, and Artistic Exchanges, New York, 1996, p. 93 (illustrated; titled Camille with Umbrella). G.-P. and M. Dauberville, Renoir: Catalogue raisonné des tableaux, pastels, dessins et aquarelles, Paris, 2007, vol. I, p. 462, no. 454 (illustrated). B. Dedman and P.C. Newell, Jr., Empty Mansions: The Mysterious Life of Huguette Clark and the Spending of a Great American Fortune, New York, 2013, pp. 218-219 and 240. Renoir, November-December 1908, no. 1. Cambridge, Fogg Art Museum, Harvard University, Exhibition of French Painting of the Nineteenth and Twentieth Centuries, March-April 1929, p. 19, no. 79. This work will be included in the forthcoming catalogue critique of Pierre-Auguste Renoir being prepared by the Wildenstein Institute established from the archives of François Daulte, Durand-Ruel, Venturi, Vollard and Wildenstein. Throughout the 1870s, one of Renoir's favorite subjects was the contemporary young woman in a secluded garden oasis. His models sit demurely on benches, gather flowers, or lounge in the grass; their fashionable dress (while not the haute couture that Manet preferred to paint) marks them as resolutely modern, and they frequently hold a parasol, that crucial accoutrement for the bourgeois woman, epitomizing both leisure and respectability (figs. 1-2). "More than Manet, and even more than Morisot and Monet, Renoir surrounded contemporary Parisians with flowers and gardens," Robert Herbert has written. "He was more of a landscapist than Manet, and more of a figure painter than Monet, so combining the two genres came naturally to him" (Impressionism: Art, Leisure, and Parisian Society, New Haven, 1988, p. 186). Yet few of Renoir's sitters from this period have the arresting presence of the young woman in Femme à l'ombrelle. Depicted in more intimate proximity than the majority of Renoir's plein-air subjects, she does not look into the distance or avert her eyes coquettishly, but rather meets the viewer's gaze head-on. The linear patterns of her clothing--a casual, dove-gray striped day dress with a stiff white collar and a pale pink bow at the neck--establish a decorative antithesis with the smoother surfaces of her eyes, lips, skin, and hair. The delicate, pearly tonalities and fine, flickering stroke that Renoir uses to render the figure contrast with the loose, bold slashes of green that describe the outdoor setting. Although the entire scene is suffused in warm light, the young woman does not dissolve into the overall effect; rather, as Barbara Ehrlich White has written, "A light that emanates from within gives her a radiant and sensual appearance" (op. cit., 1996, p. 93). Femme à l'ombrelle dates to a critical moment in both Renoir's early career and the history of the Impressionist movement. Following France's catastrophic defeat in the Franco-Prussian War, during which Renoir was mobilized in the Tenth Cavalry Regiment, the artist returned to Paris and quickly got back to work. Encouraged by his success at the Salon in 1868-1870, he decided to submit paintings to the jury once again, hoping to re-establish the favorable reputation that he had begun to build in official circles before the outbreak of hostilities. In 1872, however, his Salon submission--a free and somewhat risqué transposition of Delacroix's Les Femmes d'Alger--was rejected, a stinging reversal that put into question his newfound professional status. Emboldened rather than thwarted, Renoir began work on the largest canvas that he ever painted, a scene of an aristocratic woman and her young son riding horseback in the Bois de Boulogne. Although its heroic scale, equestrian subject matter, and high degree of finish were expressly intended to please the conservative Salon jury, the painting was nonetheless rejected, and Renoir suffered the added humiliation of seeing it hung in the Salon des Refusés instead. Renoir's rejection from the 1873 Salon was tantamount to a symbolic confirmation that he should expect nothing more from official channels. Since the end of the war, he had kept a certain distance from his old friend Monet, who had settled in Argenteuil in December 1871 and had been actively militating for an independent alternative to the state-sponsored Salon since early 1873. Now, however, Renoir decided to renew his ties with Monet, spending much of the summer of 1873 at Argenteuil with the artist, his wife Camille, and their son Jean. A letter from Monet to Pissarro in September of that year indicates just how constant a presence Renoir had quickly become in the household: "Renoir is not here, you will be able to use the bed" (quoted in B.E. White, op. cit., 1996, p. 66). By autumn, Renoir was fully committed to plans for an independent, cooperative association of artists, which would mount their own exhibitions--a defiant gesture against the power of the Salon, and thus indirectly against government authorities, during the most politically repressive years of the early Third Republic. The "Société Anonyme Coopérative des Artistes, Peintres, Sculpteurs, Graveurs, etc." was officially constituted in December 1873 at a meeting at Renoir's apartment in Paris. When the group held their first exhibition the following April, a hostile critic mocked them as the Impressionists, taking his cue from the title of Monet's Impression, soleil levant. The name stuck, and the artists themselves eventually adopted it as their own. The months that Renoir spent with Monet at Argenteuil were pivotal for the development of his style as well as his politics. Since moving to the agréable petite ville on the right bank of the Seine, Monet had been consolidating the revolutionary formal vocabulary of what would come to be known as Impressionism, producing a string of plein-air masterpieces that seem as fresh and vital today as they did when they were first painted. Indeed, as John Rewald has noted, "Probably no single place could be identified more closely with Impressionism than Argenteuil" (The History of Impressionism, New York, 1973, 4th rev. ed., p. 341). Under Monet's influence, Renoir adopted a lighter palette and more lively brushwork, and he began to accord a mounting importance to working out-of-doors. "Landscape is also useful for a figure painter," he explained. "In the open air one finds oneself applying colors one couldn't imagine in the dim light of the studio" (quoted in A. Distel, Renoir, New York, 2010, p. 99). As they had at La Grenouillère in 1869, Renoir and Monet worked side-by-side at Argenteuil, painting the town's cast-iron railway bridge from the exact same vantage point and producing almost identical views of the local duck pond. Renoir also portrayed Monet painting a hedge of multi-colored dahlias in his garden at Argenteuil, an image that bears witness to a central tenet of Impressionism as well as one of its persuasive myths: the artist before nature, spontaneously recording what he sees. With its outdoor setting and warm natural light, the present painting--dated 1873 in the artist's hand--may well have been produced during these seminal summer months at Argenteuil. Although neither Daulte nor Dauberville identifies the painting's sitter, White has plausibly suggested that it may depict none other than Camille Monet. Between 1873 and 1875, Renoir painted six portraits of Monet himself, which stand as testament to his growing admiration for the artist and to an emerging solidarity among the Impressionists. Renoir also depicted Camille, Monet's devoted companion from 1865 until her death in 1879, in a sequence of at least six portraits and very possibly more. Some of these show Camille as a fashionably dressed Parisienne in an elegantly appointed interior (fig. 3); others depict her seated in the grass, her figure dappled by summer sun. Coupled with Monet's own numerous portraits of his first wife, these canvases have elevated Camille to "iconic status in the imagery and mythology of Impressionism" (C. Bailey, Renoir's Portraits: Impressions of an Age, exh. cat., National Gallery of Canada, Ottawa, 1997, pp. 127-128). "Renoir became the visual chronicler and portraitist of the Monet household with paintings of an abandon and spontaneity rarely encountered in this work of the previous decade, even in the portraits of those closest to him," Anne Distel has written (op. cit., p. 99). The sitter in the present painting indeed bears a close resemblance to Camille Monet, with her oval face, firm jaw line, dark eyes, and auburn-tinged hair swept back from her brow. Still more striking, Renoir's model appears to wear the very same outfit that Camille does in a painting that Monet made of her in the garden at Argenteuil during the summer of 1873 (Wildenstein, no. 280; fig. 4), suggesting that the two canvases may have been executed side-by-side (although she holds a different parasol in each). Unlike the landscapes that Monet and Renoir painted concurrently, which tend to be extremely close in composition, the two artists have here produced very different interpretations of the same motif. A landscape painter at heart, Monet takes a much broader view of the scene, depicting Jean and his nursemaid playing at the right and the Maison Aubry with a wide swath of its gardens in the background. While Camille has a prominent place in the painting, her features are indistinct, and her silhouette lacks substance; she appears to dissolve in the bright light. Renoir, in contrast, depicts his sitter close-up, with only the loosest indications of landscape in the background. Although light bathes the entire scene, the figure retains a sense of sensuality, texture, and density, and her straightforward gaze lends her an irresistibly corporeal presence. White has explained, "Monet's figure is truly Impressionist; Renoir's has an underlying solidity" (op. cit., 1996, p. 93). It is not only the subject of Femme à l'ombrelle and the circumstances of its creation that marks the painting's importance in the history of Impressionism, but its early provenance as well. The first owner of the canvas was Erwin Davis, a prosperous, self-made businessman and one of the pioneering collectors of Impressionism in the United States. In 1880, Davis commissioned the American Impressionist painter J. Alden Weir to act as his agent in Paris and began to assemble a formidable collection that would eventually number over four hundred paintings by French Romantic, Barbizon, Realist, and Impressionist masters. The first large-scale introduction of Impressionism to American audiences came in 1886, when the Parisian dealer Paul Durand-Ruel mounted a spectacular exhibition of paintings by Renoir and his colleagues at the American Art Association and the National Academy of Design in New York. 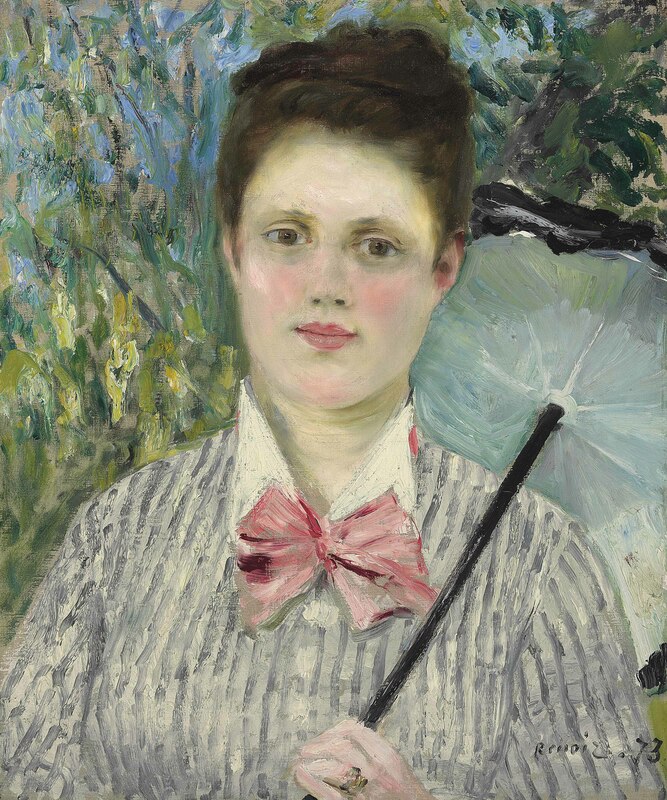 Along with Louisine Havemeyer and Alexander Cassatt, Davis was one of just three American collectors who loaned paintings to this show, and he was a principal buyer there as well. In 1889, he donated two paintings by Manet to the Metropolitan Museum of Art, which became the first examples of the artist's work to enter a museum collection. Shortly before his death in 1899, Davis returned a large cache of Impressionist paintings to Durand-Ruel, including Femme à l'ombrelle. Conor Jordan, Deputy Chairman, Impressionist & Modern Art, discusses three works by Pierre-Auguste Renoir. From the Clark Collection, these works will be offered in the upcoming Impressionist & Modern Art Evening Sale on 6 May 2014 in New York.